The last time the Carolina Hurricanes won six straight games, they were on their way to a Stanley Cup title. The Southeast Division-leading Hurricanes will be trying to match that winning streak on Friday when they visit the stumbling Buffalo Sabres. Carolina (38-29-5) won 3-0 at Chicago on Wednesday for its first five-game winning streak since Dec. 16-26 last season. The Hurricanes haven't won six in a row since a nine-game run Dec. 31, 2005-Jan. 19, 2006 en route to the first Stanley Cup in franchise history. Eric Staal had a goal and two assists against the Blackhawks, and Carolina scored all three goals - two on power plays - during a 3:48 span midway through the first period. Staal has four goals and eight assists during a five-game point streak. "It was awesome. We took advantage of it by coming out strong," said goalie Cam Ward, who made 25 saves for his fourth shutout of the season and the sixth of his career. "In the second period, it seemed like Chicago was coming on stronger, but our penalty killing was excellent. We were lucky enough that they hit a couple of posts." Ward has made 10 straight starts, going 8-1-1 with a 2.17 goals-against average over that span. 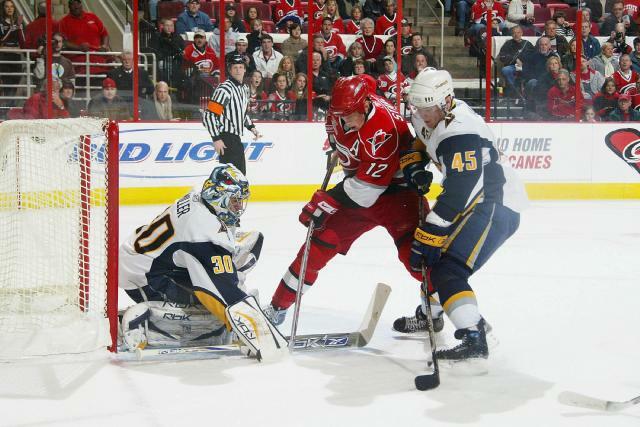 He was a big part of Carolina's 2006 Stanley Cup run, going 15-8-0 with a 2.14 GAA as a rookie during the postseason - including 3-3-0 with a 2.61 GAA in six games as the Hurricanes beat the Sabres in seven games in the Eastern Conference finals. Ward is just 2-2-1 with a 3.52 GAA in five regular-season starts against Buffalo (32-28-11), but made 27 saves in Saturday's 4-3 overtime win in the last meeting between the teams. Despite that victory, the Hurricanes have dropped six of their last eight regular- season games against the Sabres, including three straight in Buffalo. The Sabres' playoff hopes have taken a blow recently - they have dropped four straight and six of seven, including Wednesday's 7-3 defeat in Pittsburgh. Buffalo scratched five players, including defensemen Jaroslav Spacek (ribs) and Dmitri Kalinin (shoulder), both of whom were hurt against the New York Rangers on Monday and are expected to be out for several weeks. The Sabres' blue line took another blow when Nathan Paetsch was leveled by an elbow from Pittsburgh's Georges Laraque, leaving him with a concussion. Paetsch is out indefinitely. "It comes down to grinding and battling, and a lot of young guys are in new roles," said Ryan Miller, who has allowed 15 goals while losing four straight starts. "I'm not trying to make excuses, but that's what I think it is. ... What we do we have to lose? We're already on the outside looking in. We're already out of the playoffs." Buffalo is 1-5-3 in its last nine games against teams ahead of it in the conference.